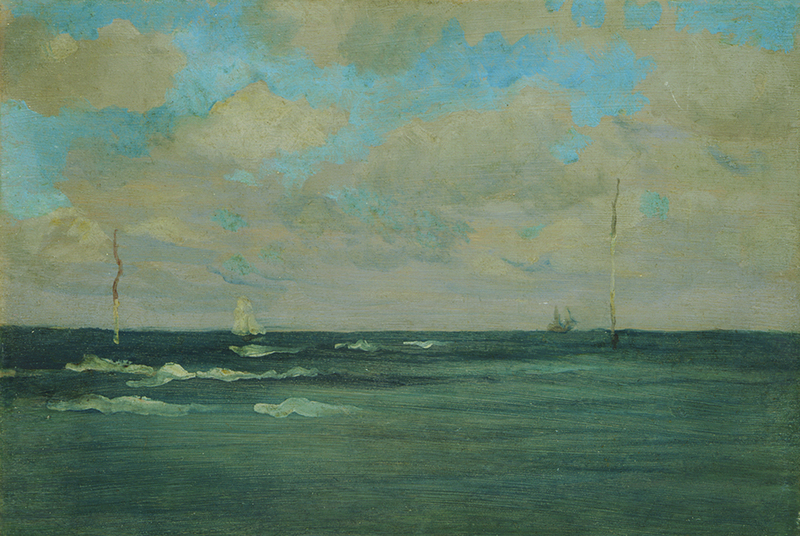 Whistler & Nature explores James McNeill Whistler’s (1834‐1903) revolutionary attitude and relationship towards the natural world throughout his life, as expressed in works ranging from his celebrated London Nocturnes to his European coastal and pastoral scenes. 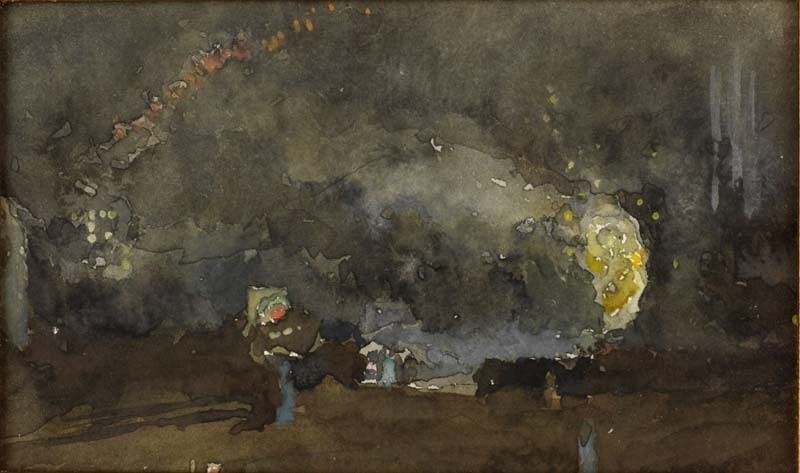 This fascinating exhibition of around 90 oil paintings, works on paper and objects ‐ such as the Whistler’s sketchbook ‐ shows how his singular vison was underpinned by his enduring kinship with the makers of railroads, bridges and ships ‐ the cornerstones of Victorian wealth and trade. 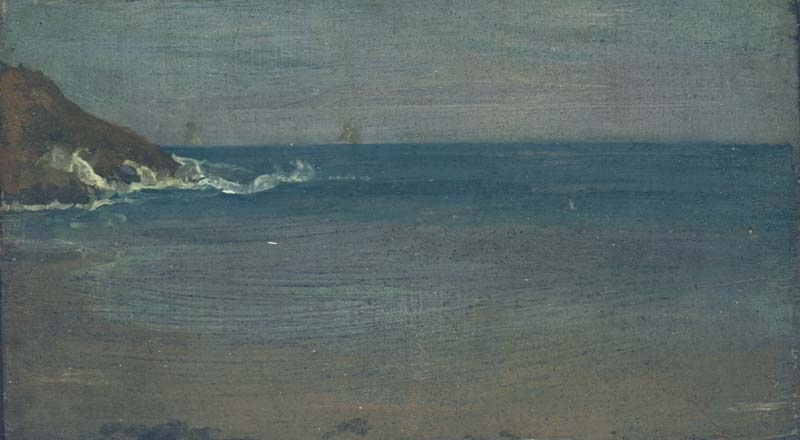 James McNeill Whistler, The Bathing Posts Brittany, 1893 © The Hunterian University of Glasgow. Whistlers’ singular vision was always defined by his enduring kinship with the makers of railroads, bridges and ships, the cornerstones of Victorian wealth and trade. Whistler inherited a tradition of British landscape painting forged at a time when land was the predominant source of wealth. Whistler’s smoky images of warehouses, bridges, harbours and ships were themselves components of a new kind of productive, wealth‐generating landscape. 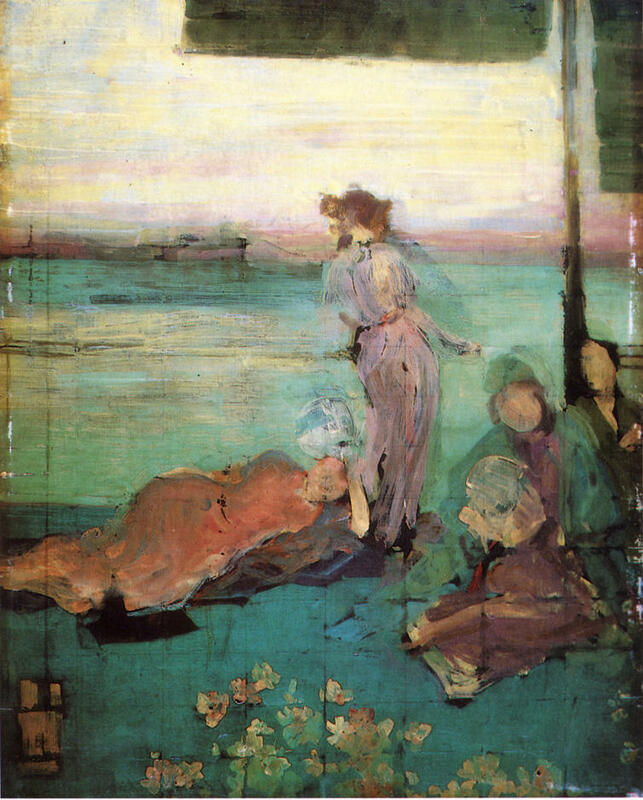 With rapid brushstrokes, Whistler captured the fleeting movement of figures – sometimes battling against the elements, at other times poised serenely in elegant robes. 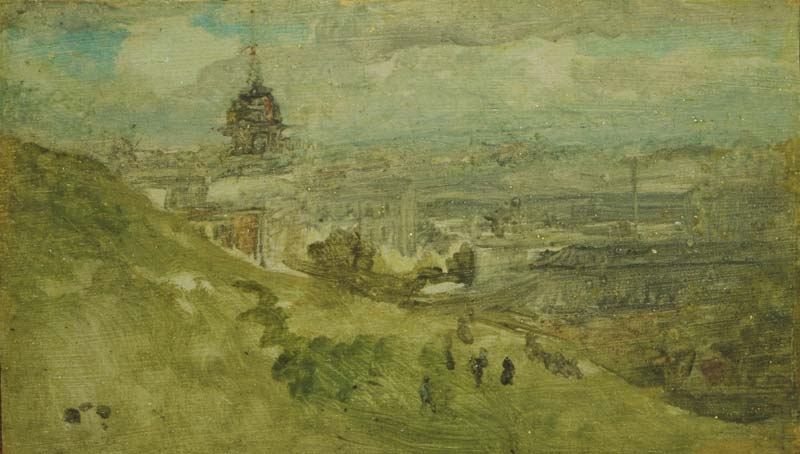 The figures in Battersea Reach from Lindsey Houses (c.1864, The Hunterian), gaze out over the Thames, dwarfed by the vast, foggy expanse of the river that has been built up via layers of thin, liquefied paint, “like breath on the surface of a pane of glass,” as the artist himself put it. This is a view of nature constrained by man‐made structures – the shadowy outline of the warehouses and chimneys on the far shore, the mast and rigging of a Thames barge in the mid horizon. Whistler and Nature showcases new research on Whistler’s technique, notably in oil, watercolour and etching, and his writings on art undertaken by academics at the University of Glasgow. It will also review Whistler’s work in the studio – his classicised figure studies in oil, pastel and chalk in the context of 19th‐century revivalism, an area that has so far received only limited research attention. Taken together, the exhibition themes shed new light on the Western classical tradition that underpins Whistler’s efforts to reinvent nature and the modern, and his reputation as the most innovative and modernizing American artist of his time. 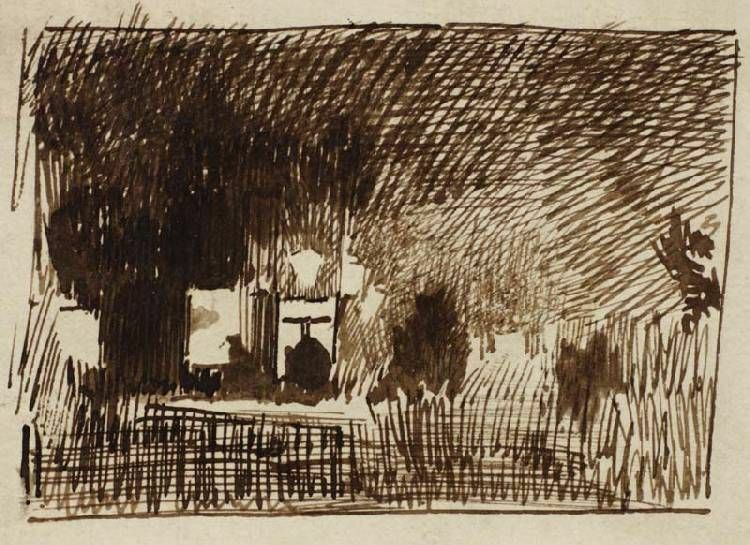 The exhibition draws upon The Hunterian’s collection alongside other UK collections, and showcases new research on Whistler’s technique (notably in oil, watercolour and etching) and his writings on art undertaken at the University of Glasgow. 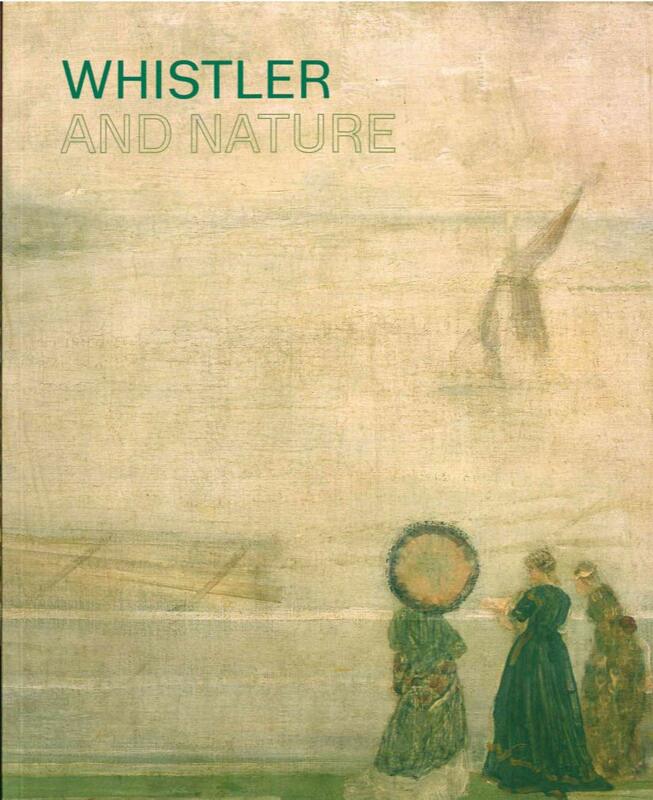 It examines 19th century gradations of the productive versus the ‘wild’ landscape and review the work of Whistler – a modernising, innovative artist of his time ‐ in the context of 19th century historicism, areas that have so far received only limited research attention. Exhibition book: Whistler & Nature by Patricia de Montfort. The exhibition will be shown next at Newcastle upon Tyne’s Laing Art Gallery, before arriving in Glasgow in the spring of 2020.